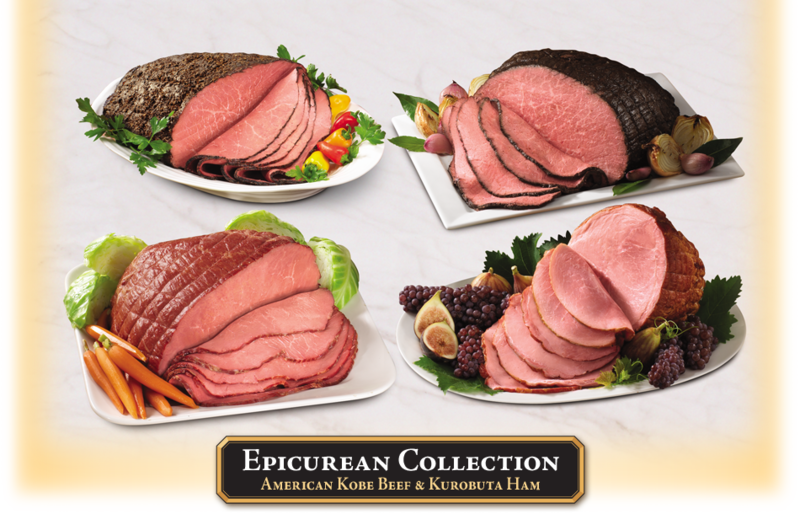 Charlie’s Pride Epicurean Collection features an exclusive variety of the finest quality American Kobe Beef and Kurobuta Boneless Ham. We start with 100% natural beef & pork from highly pedigreed American-raised stock, carefully bred for their richly marbled, incredibly tender, and exquisitely delicious meat. American Kobe Beef consistently marbles higher than “Prime”, the highest USDA grade for beef, resulting in a product that far exceeds the quality of all other US beef brands. And our 100% pure Berkshire pork is slowly smoked over authentic hardwood chips to give our American Kurobuta Ham its rich, distinctive taste. It is also known as “the kobe beef of pork” due to its superior marbling and texture. Each item from our Epicurean Collection is expertly seasoned and prepared to showcase its unparalleled flavor and succulence, resulting in a truly memorable dining experience. Treat yourself to the absolute best – American Kobe Beef and Kurobuta Ham from Charlie’s Pride. All of our Epicurean Collection products are naturally raised, and have No Added MSG or growth-promoting hormones. Exceptionally tender and succulent, suitable for the finest tables. Available oven roasted and expertly seasoned (back-to-beginning weight). Sold deli-faced (5-7 lbs), dry pack. Can be ordered in Bottom Round Flat and Eye of Round. 100% naturally raised beef, incredibly flavorful and tender. Consistently marbles higher than prime, the highest USDA grade. Exquisitely tender and succulent, the world’s most flavorful natural juice ham. These Berkshire pork hams are expertly smoked for optimum flavor using hardwood chips. Sold deli-faced (3-6 lbs), dry pack. Ask your local sales representative for our other available Kurobuta selections.